In 1976, I came to the. United States as part of the Korean Folk Ballet to perform at the Washington Monument rally. Afterward, Father and Mother Moon came often to the Manhattan Center where we practiced. I had opportunities to serve True Parents a few times during those visits. Soon after, they asked me to come to East Garden. "Miho, use all of your five senses to see only goodness. If you see bad things, close your eyes. If you hear bad things, close your ears. Use your mouth to say only good things: then you can keep strong faith that will last a long time." The one who woke up earliest at East Garden was Father. He never went to his own room before midnight. Usually he was meeting with leaders until early in the morning, going to his room after one o'clock. He would take a bath after reading letters from all over the world or reading speeches in his room. Mother often told me that if Aboji (Father) stops making sounds, I should inform her right away. She was worried that Father would fall asleep in the bathtub because of fatigue. Because Father pushed himself so much, his body often became very tired. He let Mrs. Lee and I massage him. Because his body had gone beyond its limit, when we pressed into his muscles, they did not return to their natural shape soon. I could not touch him without shedding tears. Sometimes I would hear words of prayer coming out of his mouth but realized he was sleeping. I heard these "sleeping prayers" frequently. No matter if he slept three hours a day, he used twenty-four hours a day for prayer. True Parents sacrificed time with their children to take care of others. They would always eat breakfast with church leaders, while the children finished their breakfast in the kitchen and left for school. Mother also dedicated herself completely to love our church leaders. One day, when she was in late pregnancy, at a time when she might give birth at any minute, she prepared to go shopping with leaders from Europe. Since I could not stand it, I asked Mother, "Why don't you stop going out?" But she replied, "You don't have to worry about me," and left to buy gifts for those visiting leaders before they returned to their countries. Once, one of the True Children, Kook Jin nim, had a very bad day in school. When he got back home, to avoid worrying True Parents, he went straight to his room. True Mother worried about him and sent me to his room. Kook Jin nim had tears in his eyes, but he put a smile on his face and went downstairs and said, "Omma, I'm home." All the True Children made these kinds of sacrifices because they knew that True Parents were working for God's will. In the early 1980s, True Father had to face accusations from the New York District Attorney. After a long court case, Father had to go to Danbury prison' on July 20, 1984. I remember that day as if it were today. So many church members came to East Garden. Father gathered all the older True Children and spoke to them about what was going to happen. The small children asked Father, "Where are you going?" He answered, "Don't worry. I'll be back soon. Study hard. Don't fight with each other." Many members were in tears. Father and Mr. Kamiyama left in a car to go to prison. Father worked as a "servant of servants," mopping the floor, washing dishes, cleaning the toilet. Every day Father washed the dirty mops by hand. He willingly did all the work that was required of him but also did many extra things as a way of serving the other prisoners around him. At East Garden, True Mother also did the hardest, most menial work she could find, so that she could share, as much as possible, the kind of experience that her husband was going through. She pulled weeds in the garden in the hot sun and cleaned the house with the Japanese sisters there. Sometimes there were threats against Father. Many nights she could not sleep, worrying about True Father. Sometimes she asked me to stay at night in her room. She waited for a phone call from True Father each morning. She was in tears, hearing Father's voice. Occasionally, Father was able to visit East Garden for twenty-four hours. He would go to his room immediately without speaking to anyone. He wanted to change out of his prison uniform, take a shower and shave, and put on regular clothes. When he came down to the living room, singing, with a big smile. He never wanted to show that he had been in prison that day. Then he met with leaders and with the True Children. During these times, I went up to Father's bathroom. I would see the undershirt Father had been wearing. Many times the undershirt had a hole in it. The socks also had holes in them. When I saw these miserable clothes, I could not help crying. Mother said we should keep these for posterity. One night, Mrs. Lee and I gave True Father a massage. When I looked at Father's hands, I saw many scars on them and roughness from hard work at the prison; they were like the hands of a farmer. I was crying and my hands began to shake. True Father said, "Miho, don't worry." I realized that Father had been working hard, trying to serve the other prisoners. During this time, even during the cold winter when the temperature dropped into the teens, Father's oldest son Hyo Jin nim, the other True Children and all of us staff members did a prayer vigil every night outside at the Holy Rock, sometimes until 4 AM. 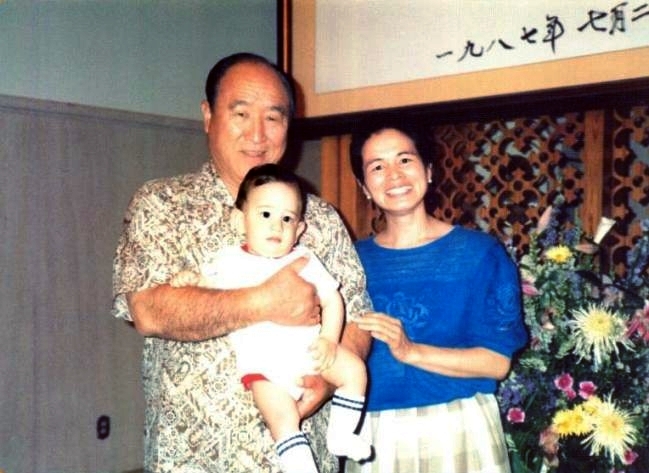 On August 20, 1985, Father could come back safely home. I realized that between East Garden and Danbury was a bridge of love that would never be broken. Every day at East Garden was a treasure I can never forget. Even now, living in New Jersey, I do not feel far from True Parents, because I experienced so much love from them so many times.